Hi everyone hope you are all well. BBC2 here with the last part of our Eurovision song contest meal when our good friend Liz came for a sleep-over and we tried out some new and old recipes on her. Like the Lentil and Bacon Soup – see here, followed by Chicken in White Wine Sauce, asparagus and what we’ve since remembered are ‘Berrichonne Potatoes’ – see here. 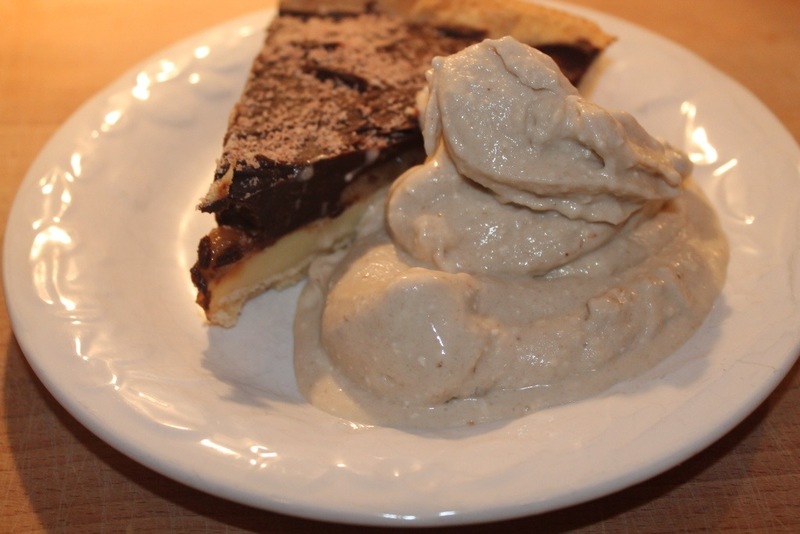 And to round off the meal we had this; a Chocolate and Banana Tart with quick and easy Banana Ice Cream. I know that like me Liz has a sweet tooth, so when I was thinking about what to make for pudding, I knew I had peeled and sliced some bananas and frozen them with a view to using then at a later date. 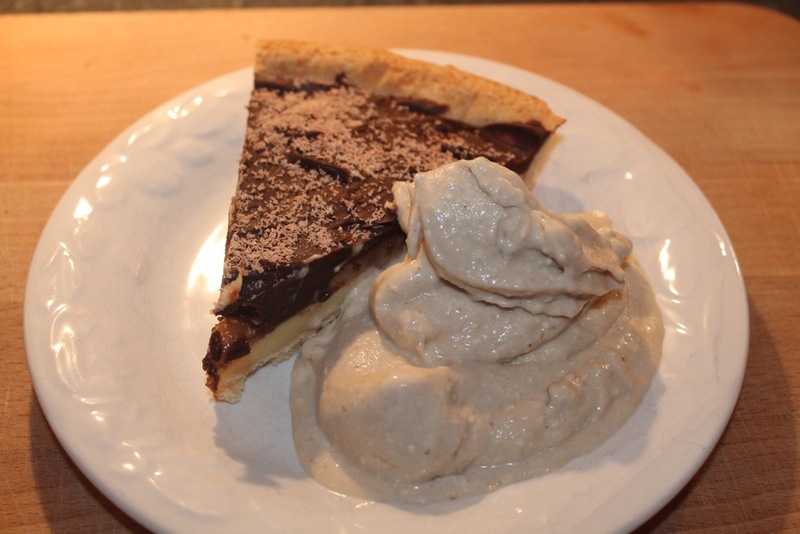 I wanted to bake something and a chocolate tart with banana ice cream seemed the way to go. 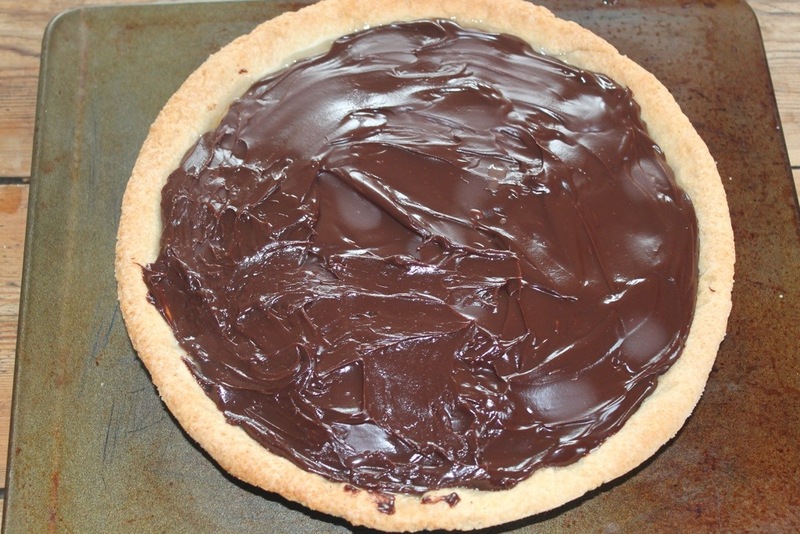 I decided to use white chocolate and dark chocolate, as you will see from the method this tart is done in several stages and during one of those stages I also decide to add the sliced banana. I know it sounds like a lot of work but honestly it’s not, as it is done in stages you can make it over a couple of days. I will say it is rich but I think served with ice cream this makes it even better. To make the pastry put the flour and caster sugar in a food processor and pulse for a second or two, then add the butter pulse again until you have fine breadcrumbs. 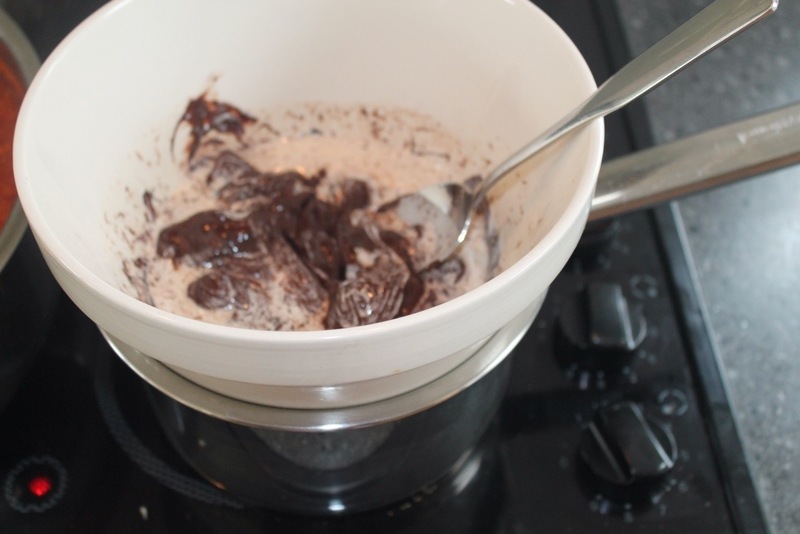 With the processor running add the beaten egg to the mixture and it should come together in a ball. Roll it out on a well floured surface to fit the tin, using the rolling pin to support the pastry lower it over the tin helping it into the corners of the tin by gently pressing into the sides of the tin leaving a overhang. You will need to blind bake it now, I scrunch a piece of greaseproof paper to line the inside and fill with baking beans – but you can use rice or any dried pulses such as kidney beans. Then pop it into the oven for 25 minutes and take it out and remove the beans and greaseproof paper and return to the oven for another 5 minutes and reduce the oven temperature to 160c Fan. Next take the pastry case out of the oven and allow it to cool and carefully trim off the excess, but leave the pastry case in the tin. When the pasty case is cold you can make the white chocolate filling, using a pan of hot water (not boiling) place a bowl on the pan ensuring the bowl does not touch the water, then add the white chocolate broken into small cubes and pour in the cream, when the chocolate starts to melt give it a stir and take the pan off the heat and allow the chocolate to melt, when it has melted pour it into the pastry case, ensuring it is spread evenly over the bottom and leave to set for a few hours. When it has set repeat the same process with the dark chocolate as you did with the white chocolate, while the dark chocolate is melting slice the bananas and lay then over the set white chocolate to cover the surface evenly, then carefully pour the melted dark chocolate over the bananas and spread to ensure the chocolate evenly covers the bananas and meets the pasty’s edge. 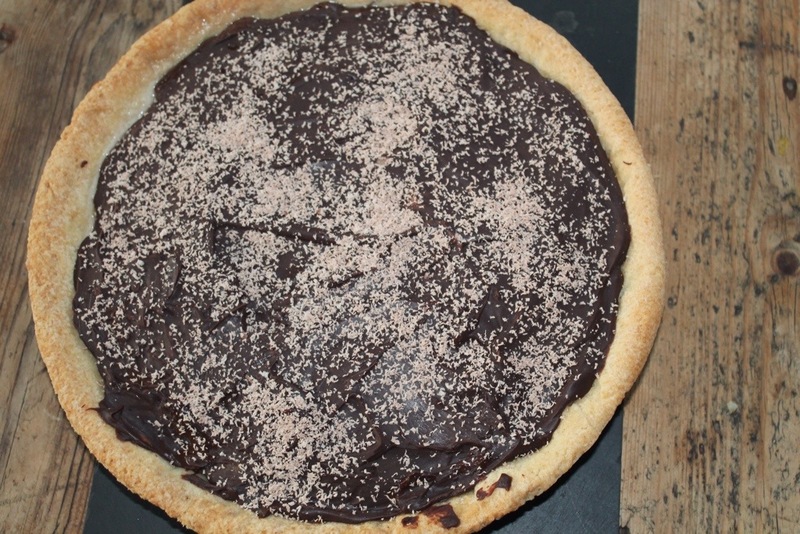 Then leave to set, when it has, then grate some milk chocolate over the tart and eat with gusto! I like to serve this with an easy banana ice cream: peel and slice one banana per person and freeze, when the bananas are frozen and you are ready to serve the tart, put the frozen banana into a blender and pulse for a minute then add a couple of tablespoons of cream to loosen the mixture and pulse until smooth and of an ice cream texture, it takes a couple of minutes to make not counting the freezing time but it goes well with the tart. I hope you give this a try and do let us know what you think, I know I say it all the time but we do look forward to all your feedback and comments. 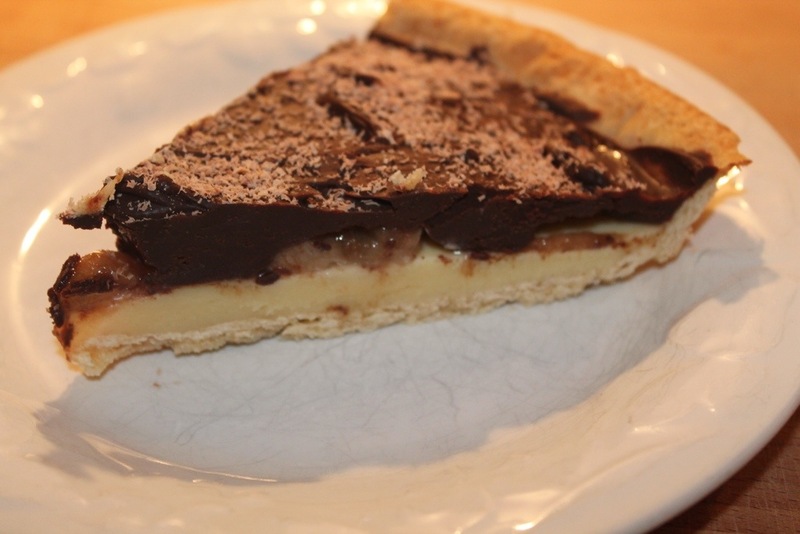 Tags: banana, chocolate, dessert, ice cream, pastry, tart. Bookmark the permalink. 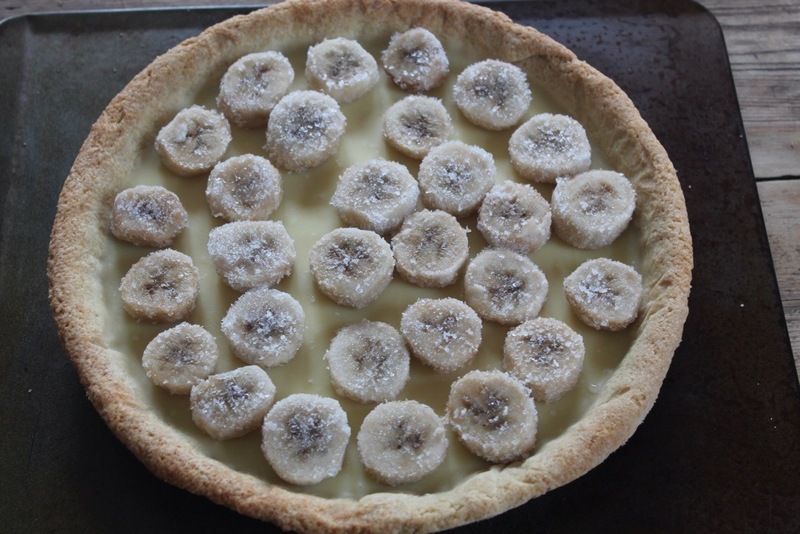 I love banana desserts, and this looks like one of the tastiest I’ve seen. I’ve made the frozen banana “ice cream” and I’m always surprised at how good (and healthy!) something so simple is. The last time, I threw in a handful of frozen blueberries and it was amazing! Thank you. We love the frozen berries idea and are going to try that next time thanks! Thanks, what’s wrong with both? Lol!